Figure 4.27 (a) Annually averaged daytime-average HO, abundance (pptv). (b) OH abundance (pptv). Values are from the Goddard two-dimensional climalological circulation model J73]. Figure 4.28 Lower stratospheric OH number density measured by the Harvard HO, instrument [126J during the 1994 ASHOE-MAESA (black) and 1997 POLARIS (gray) missions (T. F. Hanisco, personal communication, 1998). The solid line is 3xl(! "(95 - ISZAI). 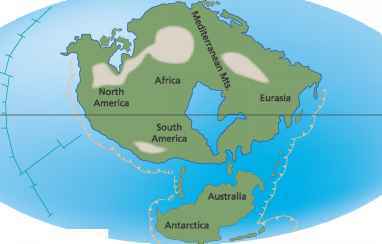 Negative SZAs correspond to times before local noon. so the rate that this cycle destroys HO, is 2A|1N0.+0M[HN0<J[0H|. The reaction between OH and HN04 can also be an important HO, loss pathway. Finally, the reaction of OH with HC1 (reaction (4.16)) is a non-negligible HO, loss pathway. In the lower stratosphere the importance of these various HO, loss terms are variable. No single term dominates at all times, and all have their moment in the Sun (so to speak). Finally, it should be noted that at sunset the formation of HO, ceases. Net loss of HO, as well as the formation of short-lived 110, reservoirs such as HOC1, HOBr, and FLO, continue, however. The result is that HO, is rapidly removed after sunset, and the abundance of HO, can be considered zero during the night. CH,Br (see WMO [13[, Table 6.3) , 3.5 pptv for CBrOF, , and 2.3 pptv for CBrFj 1128]. 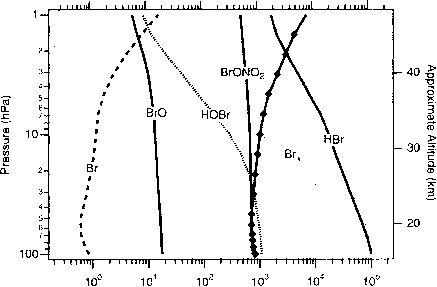 Including small contributions from other species, total organic bromine entering the stratosphere at that time was ~15-20 pptv [129,130], All of the halons and about half of the CH,Br are anthropogenic in origin. Thus, about two-thirds of bromine in the stratosphere originated from human activities. Several minor species, such as BrONO and Br2, have been neglected in Equation (4.72). The abundance of inorganic bromine Brv, as a function of other long-lived species, is provided by Wamsley et al. . Figure 4.29 plots daytime-averaged lifetimes of the various members of Br, as a function of altitude. Owing to the larger size of bromine atoms compared to chlorine atoms, molecules containing bromine tend to have weaker intramolecular bonds, and are therefore shorter lived than the chlorine-bearing version of the same molecule. For example, the lifetime of HBr in the lower stratosphere is about a day, while the lifetime of HC1 in the same region is about a month. In fact, the lifetimes of the Br, species are so short (a day or less) that the partitioning of Br, is almost entirely determined by photochemistry, with little contribution from transport. Like Cl„ Br, therefore contains the species involved in the catalytic loss cycles that destroy O, (e.g. the "active" members). ~ l/(7„(,b,+A„OBr-oi0)), tB(. ~ [Br<l/(t*Bl0tNO,rBrO)fNOJ + -,„,.„„,[BrO][HO;] + ¿B,,„o2[Br][H02l).